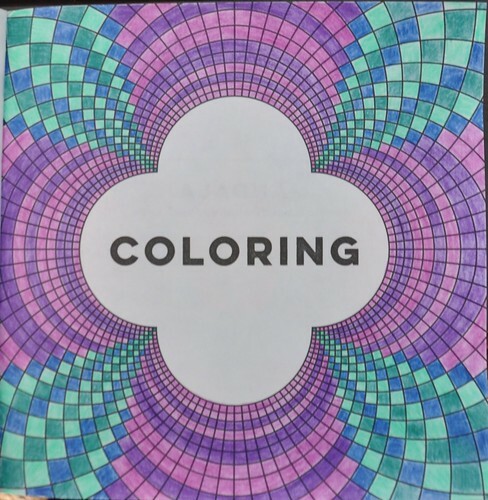 In a blog from last year, Coloring My World, I mentioned how my diagnosis with Stage 3 Lung Cancer led to my having a lobectomy to remove the tumor. This was followed by months of chemotherapy. Those months were difficult – enduring, surviving and recovering from cancer treatment. Unable to carry on my usual activities, I took up coloring to pass the time, to attempt to relax and to creatively challenge my thinking. 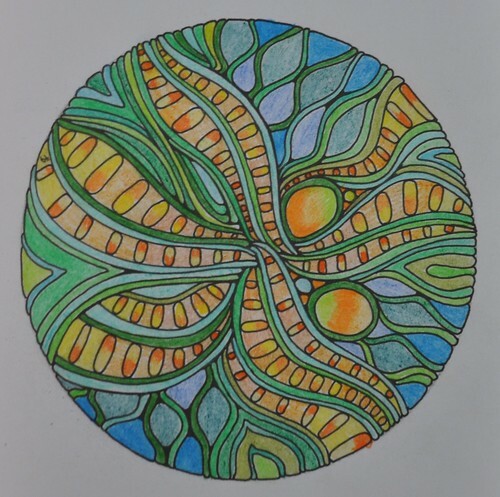 In this blog are a few photos of pictures I have colored most recently. I think each of us humans should bring some beauty into the world, in what forms we can – art, music, gardening, poetry, photography, meditation, etc. 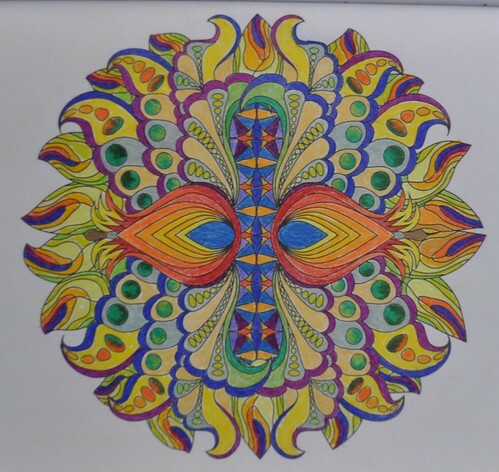 I am not an artist, but I enjoy coloring and seeing what emerges on a page. I never have a finished product in mind when I begin, as I don’t have the artistic capacity to imagine what the end product should be. The wonderful part of this is the end product is also a surprise to me! So I too await to see what emerges as the finished product. Often I start with one thing in mind, but as it sometimes takes days to finish a picture, my ideas change as to what I want to do or what colors I want in the picture. So each picture ends up being a visual of my mind’s wandering through the fields of color. Much of what I do is pure experimentation as I have no training in the visual arts. Frequently what guides me in the color choice is to pick a color not already used in the picture. I use a variety of colored pencils to do the pictures. 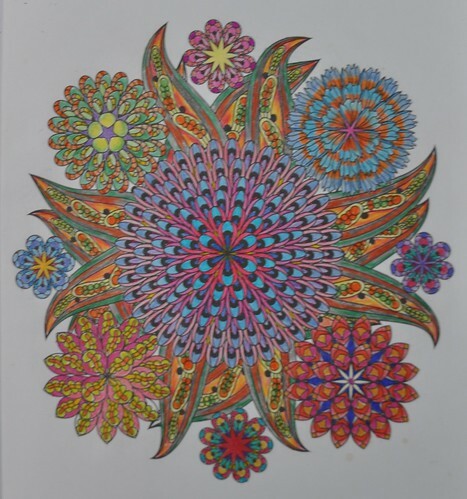 Originally I gathered together old colored pencils I found around the house, left from my 4 children’s school days. My offspring are all now well into adulthood, and no doubt, like myself, thought colored pencils are part of childhood that you grow out of and leave behind. I’ve discovered as an old man a delight in coloring I never imagined as a child. And yet, it is a return to a childhood joy. I now appreciate colors and coloring with the advantage of being an adult. There is great freedom in the craft. There is more to it than staying within the lines, I finally realized. My health issues have continued. Recently I had to have a lens implant in my right eye to restore my vision. Once my eye has healed, I will be getting new prescription glasses and perhaps will be able to see a bit better to continue coloring. I am participating in a medical study of a new targeted chemotherapy aimed at the particular genetic mutation the cells in the tumor had. The health saga wears on. The coloring is therapeutic as it restores youth in a way I never appreciated when I was young. Perhaps unconstrained by training, I see colors and patterns I’ve never seen before. 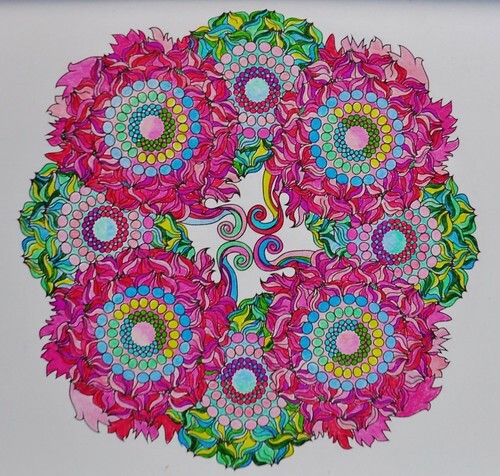 You can see all of the photos I’ve taken of pictures I colored on my Flickr page at Coloring.